On October 1, 2017, the submarine S-42 set sail from the ThyssenKrupp shipyard in Kiel, northern Germany. The fourth of four submarines ordered by the Egyptian government since the outbreak of the Arab revolutions — at a cost of €1.4bn — quietly passed through the Kiel Canal to the port city of Emden. There, it met a French Corvette-class attack ship, also newly built for the Egyptian Navy by France. Together, they set sail for Alexandria. 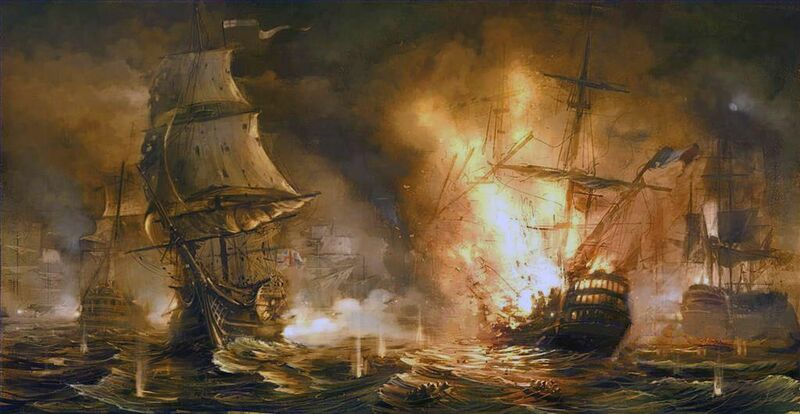 On August 1, 1798 the French gunship, Orient, the flagship of Napoleon’s fleet, dropped anchor in Aboukir Bay, northeast of Alexandria, and prepared to engage with Nelson and the British Navy. The Battle of the Nile would be the culmination of months of naval maneuvers and skirmishes in the Mediterranean, and its victory, Napoleon believed, would give the French an imperial counterweight to British India. The Battle of the Nile lasted only a few hours. By nightfall the thousand-man Orient was ablaze and before midnight struck it had exploded. The French were defeated, British naval supremacy was established and Nelson’s coat of arms thereafter featured a palm tree standing between a fort and the sinking French flagship. On June 20, 1895, Kaiser Wilhelm II attended the opening of the Kiel Canal, a 98 km waterway dug to bypass Denmark and the Jutland Peninsula for vessels moving between the North and Baltic Seas. With Germany unified, dynamic and triumphant in trade and in war, the Kaiser wanted to ensure his new country’s naval capacity was sufficient to challenge the British over Germany’s accelerating need for raw materials from the south. He asked Friedrich Alfred Krupp — already chief armourer to the Reich, son of the industrial master of steel, the Kanonenkoenig — to build him such a navy. 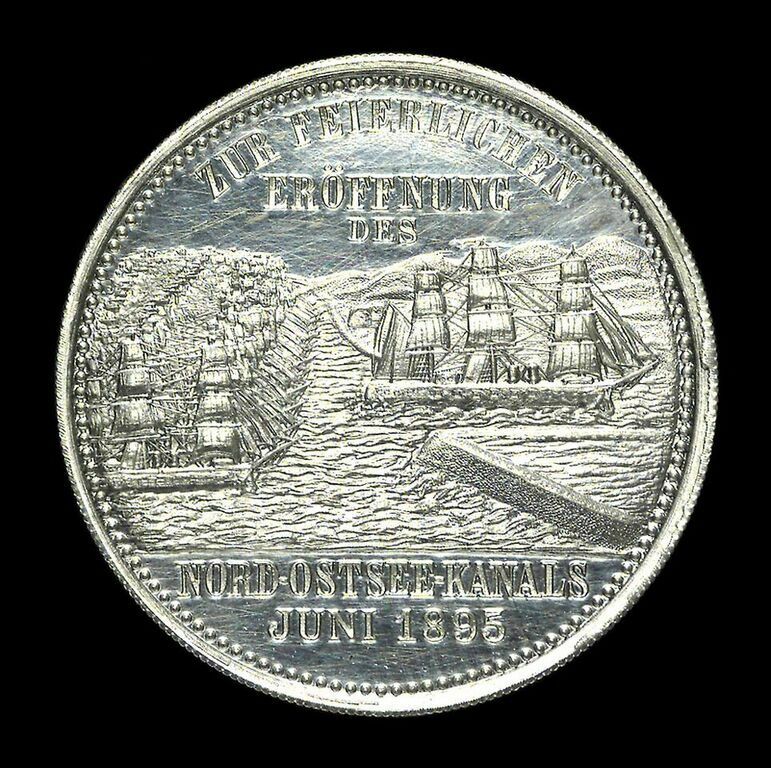 Within one year, Krupp had bought a shipyard in Kiel and begun work. On July 3, 2013, Colonel Abdel Fattah al-Sisi became the de facto ruler of Egypt. Though he went on to orchestrate one of the bloodiest massacres in recent political history, he was uniformly embraced by the full spectrum of elected neoliberals, authoritarian strongmen and hereditary rulers who constitute the current International Community. Faced with a country of consummate precarity, crumbling infrastructure, endemic corruption, dwindling land and spiraling debt, Sisi’s military government has found answers only in fear and discipline: imprisoning opponents, disappearing critics, poisoning the airwaves, blocking websites, building prisons, bombarding Sinai and selling land. Sisi has elevated his country in one regard: Egypt today is the third largest importer of weapons in the world. Modern warfare began in 1870 at the siege of Metz. The final battle in the Franco-Prussian war, it was the first time that the true scale of industrial, metallurgic death revealed its true potential. Over two months the Prussian artillery bombarded French troops holed up in the city’s fortifications. Though each army had the same number of cannons, the bronze artillery of Napoleon III’s army was no match for the range, accuracy and durability of Prussia’s steel cannon. 193,000 French soldiers were killed to the Prussians’ 5,740 casualties. After Metz came the siege of Paris, the collapse of the Napoleonic dynasty, the unification of Germany and the birth of the Second Reich. The Prussian cannon was the passion and invention of one man: Alfred Krupp. The father of the future ship-builder would be known from now on as the “Cannon King.” And the name was to be passed down for four generations. On November 15, 1855, the Paris Exposition Universelle closed its doors. 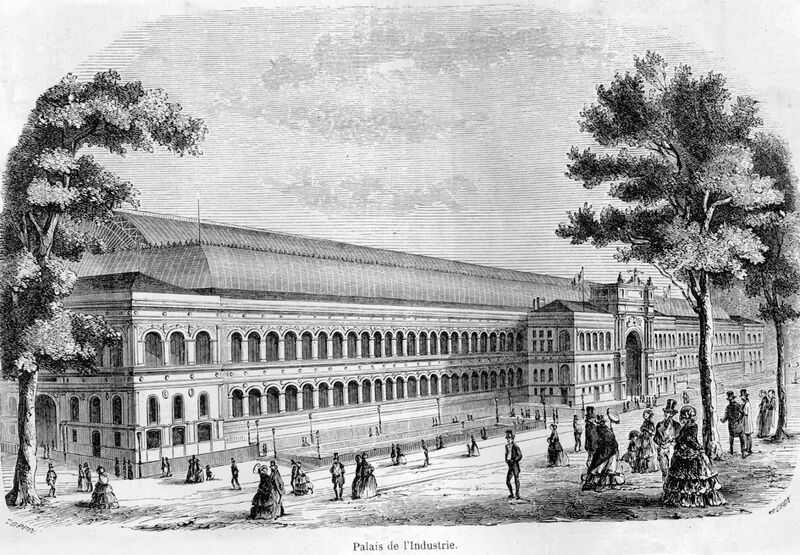 For six months the continent’s leading engineers, inventors and industrialists had displayed their most modern works under the vaulted glass and cast iron ceiling of the monumental Palais de l’Industrie. Among them was Alfred Krupp. Renowned for his Essen steelworks and his weldless railway tire, he had come to display his newest, most prized, invention: the steel cannon. Artillery was Krupp’s obsession. For years he had been trying to convince the major military powers of Europe — France, Russia, Prussia — to switch from bronze-forged cannon to his harder, more accurate steel. But no matter how convincing the range tests were, or how admired the prototypes, the conservatism of the old generals could not be shaken. After over a decade of pitches, not a single major order had been placed. 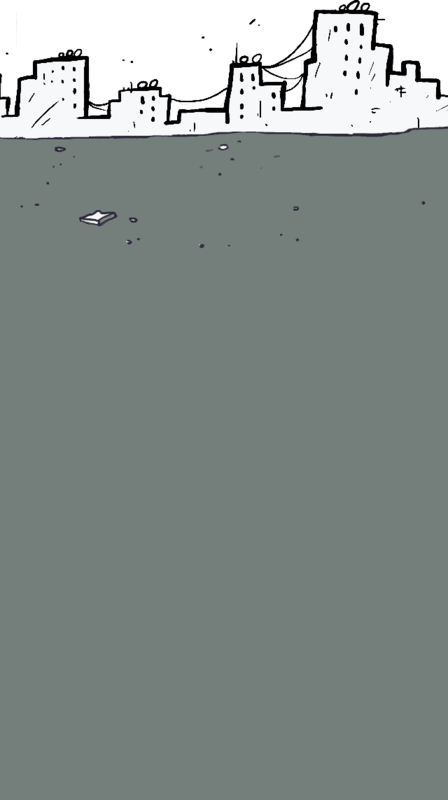 For six months his revolutionary cannon had been on display: but only one order had been placed. One order to keep his dream of steel artillery alive, that kept the road to Metz open. That order, for 26 steel cannons, was placed by Said Pasha, the Wali of Egypt. On March 4, 2017, Angela Merkel attended a state dinner by the pyramids. She posed with Sisi by a blue-lit Sphinx, then sat down to enjoy a bilingual serenade about the land of the Nile followed by a hieroglyphic-inspired dance. The cultural display was clearly designed to underscore the increasingly amicable diplomatic relationship between the two countries. Sisi is an enthusiastic adherent to the international status quo: joining the West’s existential crusade against terrorism, inflicting neoliberal structural reforms on an economy hollowed out by corruption, sealing the country’s northern border to refugees and collaborating with Israel to deepen the punishment of Gaza. He has doubled Egypt’s external debt through purchasing of foreign industrial exports. In 2017 Egypt was the world’s top importer of German weapons. Said Pasha’s son, Khedive Ismail of Egypt, drove an aggressive, expensive modernization project – for which he drew deep loans from banks in London and Paris. The digging of the Suez Canal would ultimately be his undoing, but among his foreign purchases were 380 Krupp cannons to mount on Egypt’s coastal forts. By 1879 the country was bankrupt and the Khedive was forced into exile. When Ahmed Orabi launched his revolt two years later, chief among his goals was the restoration of national control over the exchequer: that the strategies of servicing and repaying the external debt should be determined by an Egyptian executive supervised by Parliament, not by foreign executors. The British Navy was dispatched to put Orabi and his movement down. 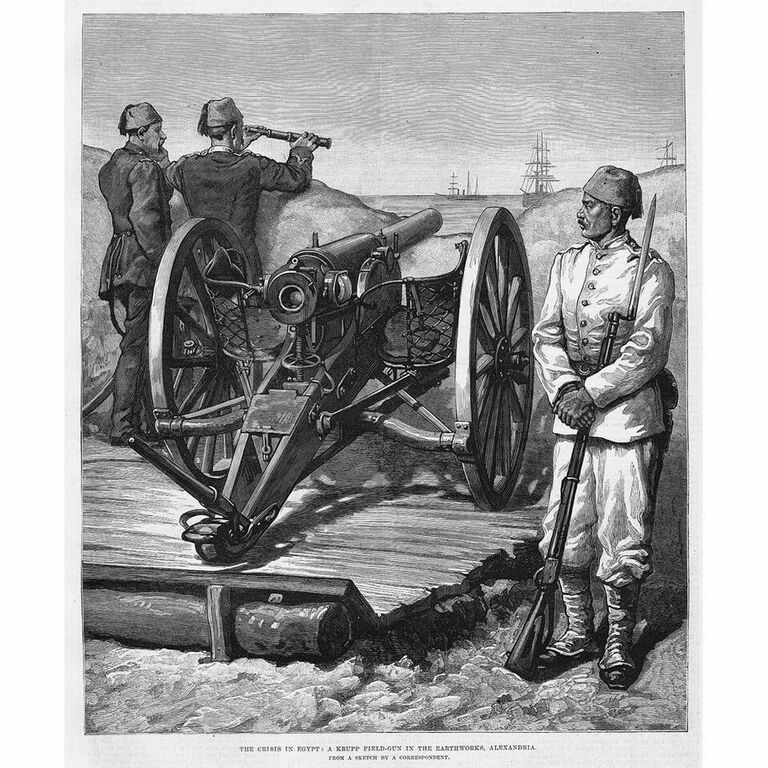 Orabi ordered the Krupp cannon to concentrate in Alexandria. At 7 am on July 11, 1882, the British bombardment of Alexandria began. The Krupp artillery proved ineffective in defense: within 10 hours the battle was lost, the city was burning and, on July 13, British marines landed and the invasion and occupation of Egypt began. As China and Japan prepared for war in the 1870s, both countries looked to the European arms market for a tactical military advantage. China’s Li Hongzhang placed a large order with Krupp for 275 field guns and 150 cannons to guard a key fort. The first submarine to be produced in Krupp’s Kiel shipyards was laid down in 1903 and Unterseeboot production has continued — with some interruption — to this day. Krupp engineers designed and built the latest in naval warfare for the Kaiser’s Imperial Navy, the Reichsmarine of the Weimar Republic, the Kriegsmarine of the Third Reich and today’s Bundesmarine. In 1999, the companies of Krupp and Thyssen merged to become ThyssenKrupp. In 2001, the submarine S-120 was laid down, the first of four vessels ordered by the Greek Navy for a total of €2.5bn. This was followed by highly similar contracts, signed in quick succession with Mediterranean competitors Turkey, Israel and Egypt. In October, 2013, Greek Minister of Defense Akis Tsochatzopoulos was convicted of receiving over €50m in bribes to push through weapons contracts. While in office between 1998 and 2001, he oversaw Greece’s “biggest ever defense procurement program.” Among the contracts he promoted were the four ThyssenKrupp submarines. On February 13, 2018, Israeli police recommended charging Prime Minister Benjamin Netanyahu with bribery. One of the open case files on Netanyahu, known as Case 3000, concerns the alleged payment of bribes to senior Israeli figures and Netanyahu confidants to push through a contract for four ThyssenKrupp submarines. Military contracts in Egypt are not subject to public audit. On December 6, 2016, a 670-ton steam turbine was loaded onto a barge, docked exactly 14.3 km away from the ThyssenKrupp headquarters in Essen. The barge made its way down the Ruhr and Rhine rivers to Antwerp, where it was loaded on to an ocean liner bound for Egypt. 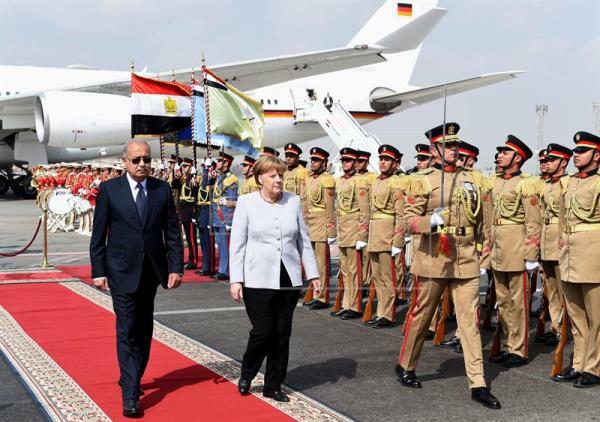 Although Egypt had become the top destination for German weapons, Angela Merkel was at her Sphinx-side state dinner in 2017 on much bigger business than submarines. The enormous turbine was part of a megaproject between Siemens and the Egyptian government to construct three power plants. The deal, worth €8bn, was the single largest contract signed in Siemens’ 169 year history and Merkel was in the country to attend the inauguration of its construction. The colonial invasion and occupation of Egypt by the British was triggered by a debt crisis created by years of capital export from banks in Paris and London. New loans were taken out to pay old debts, with revenues from various state assets assigned to their repayment. The private revenues of the Khedive’s estate were assigned to service the loan from the British Anglo-Egyptian Bank in 1866; railway revenues to the loan from Fruhling & Groschen of 1867; income from customs, fisheries and lock tolls to the 1868 loan from the (British) Imperial Ottoman Bank, (French) Société Générale and (German) Oppenheim Bank; the revenues of the railways of Lower Egypt, personal and salt taxes to the enormous 1873 loan from the Imperial Ottoman Bank, Société Générale and Bischoffsheim & Goldschmidt. By 1878, the Khedive had been stripped of all principal sources of state revenue — and was still unable to satisfy his creditors. To finance the construction of the Siemens megaproject, the Egyptian government secured loans of €4.1bn in 2015. This financing was organized by three German banks: HSBC Germany, Deutsche Bank and the German Bank of Reconstruction. The interest rate was undisclosed. In 1878, a commission appointed by the imperial powers in London and Paris to assess the Khedive’s (in)ability to repay his creditors concluded that the blame lay with a national system of arbitrary taxation, budgeting failures, uneven distribution of lands and water and the use of forced labor on the Khedival estates. The profits made by Krupp or Siemens in Egypt are not simply a question of the colonial dynamics of economic subjugation, chronic underdevelopment and corruption. It is an economic dynamic that has, in fact, played a central role in the shaping of both colonizer and colonized. Krupp and Siemens are two of the firms that built our technological conception of modernity — and the infrastructure that maintains it. Capital export and industrial production flow south, debt servicing and natural resources flow north: but pay-outs are enjoyed at the top of the military-industrial pyramid in both north and south. Transparency International currently ranks Egypt as more corrupt than Argentina and China, but less so than Russia and Venezuela. The Egyptian deal with Siemens was valued at, it is worth repeating, €8bn. Third World Authoritarianism is desirable for wealthy exponents of free trade because of the profits that can be made in the absence of industrial regulations, which were achieved by strong unions in uncolonized parts of the world in the late 19th and early 20th centuries. On October 31, 1945, a confidential internal Siemens report was filed, titled: The Use of Foreign Civilian Workers, Prisoners of War, Jews, and Concentration Camp Inmates in the House of Siemens. The report confirms that 3,900 concentration camp inmates were used as slave labor by Siemens during World War II. At Nuremberg, it was estimated that 100,000 people had been forced to work in nearly 100 Krupp factories in Germany, Poland, Austria, France and Czechoslovakia — including one camp purpose-built at Auschwitz. On February 20, 1933, a secret meeting of Germany’s most powerful captains of industry was assembled. Among those present were Gustav Krupp von Bohlen und Halbach, then head of Krupp; Ludwig von Winterfeld, board member of Siemens; and Wolf-Dietrich von Witzleben, then head of the office of Carl Friedrich von Siemens. Between them, the two dozen men in the room represented companies worth half the capitalization of the entire Berlin stock exchange. Distant laborers can be pushed beyond breaking points, and if their authoritarian governments collapse due to the pressure, then there are only further windfalls in debt servicing. Steam turbines, submarines, elevators, cars, medicines, ironworks, plastics, motors, pumps, valves, hydrocarbons, printers, washing machines, video cameras, tractors and thousands of other industrial goods journey south every year from Germany to Egypt. In 2016 southward trade was valued at US$4.76bn. Meanwhile, a paltry $1.27bn of primarily raw materials flows the other way. Thirty-seven percent of Egypt’s export to Germany is crude petroleum. Fruit and vegetables (13 percent), textiles (15 percent), metals (8.8 percent), stone and glass (3.3 percent). It is not simply a cheap shot to refer to Nazi economic policy when talking about Germany. The point is that it is not about the Nazis. It is about capitalism. The capitalism which predated and was enthusiastically embraced by Hitler. The capitalism that survived World War Two and has been resurgent and accelerating since 1980. Colonialism is a necessary facet of capitalism, the maintenance of underdeveloped nations for industrial exports is an essential part of the system. Slave-driving authoritarian regimes are interchangeable – their nations little more than the manageable units of resource and border control. There is no way of escaping the dynamics of colonialism without dismantling the architecture of capitalism. In 1948, Alfried Krupp, the fourth Canon King, was convicted at Nuremberg of crimes against humanity, crimes against peace and “exploitation and maltreatment of large masses of forced foreign labor.” He was sentenced to 12 years in prison and stripped of his family holdings. Yet, only three years later, on February 3, 1951, Krupp was released from prison. The US High Commissioner for Germany, panicked about the threat of Communism and eager for the wheel of German capitalist industry to turn again, restituted Krupp’s company to him and released all his co-defendants. All except for Ewald Loeser: the one defendant who had been secretly in the resistance. *Note: At the author’s request, the indicated sections of this piece have been edited since it was originally published.